The calling on God to witness that the statement made is true or to make the fulfillment of a promise bind under a more solemn obligation. This is a congregation of secular priests, who "offer" themselves to the bishop, to be employed by him in any part of the diocese he may choose, and upon any work which he may commit to them. St. Charles Borromeo, archbishop of Milan, having found in his large diocese, parts of which were greatly neglected or totally abandoned, the need of a band of zealous self-sacrificing laborers, who would be ready to go and do at once whatever he commanded them to do, founded this congregation of "Oblates of the Blessed Virgin and St. Ambrose" in 1578. Be established them in the church and presbytery of the Holy Sepulchre at Milan. Dividing the congregation into six “assemblies," he directed that two of these should always remain in the community house in the city, while the four others were at work in other parts of the diocese. The Church celebrates certain feasts till the eighth or octave day. The number eight is supposed to represent perfection, for the seven days of the week are taken as figures of the ages of the world, and the eighth of the eternal rest which is to follow them. An antiphon which used to be sung by the choir while the faithful made their offerings of bread and wine for the Maas, and for the support of the clergy. The Offertory is said immediately after the Creed. There are three holy oils, consecrated by the bishops on Holy Thursday, and received from him by the priests who have charge of parishes and districts. · The oil of catechumens, used in blessing fonts, in baptism, consecration of churches, of altars whether fixed or portable, ordination of priests, blessing and coronation of kings and queens. · Chrism, used in blessing the font, in baptism and confirmation, consecration of a bishop, of paten and chalice, and in the blessing of bells. · Oil of the sick, used in Extreme Unction and the blessing of bells. A name assumed by certain priests and lay-people in Germany who protested against the Vatican definition of Papal infallibility, and formed themselves into a separate body. A word used by the early theologians and adopted by the Council of Trent to express the nature of the effects which the sacraments produce. So the address begins in which, after the Offertory and Lavabo, the priest bids the people pray that his sacrifice and theirs may be acceptable to God. In the earliest times Mass could only be said in private houses, and after the erection of churches it was still often said in private dwellings. The growth of the parochial system led to a distinction between parochial churches and oratories or chapels. An oratory is public or private, according as it has or has not a door opening into a public thoroughfare. The older canon law allowed Mass to be celebrated in either with the bishop's permission. But the Council of Trent limited episcopal powers in the matter, and the following is the present state of the law. A bishop may always permit Mass in a public oratory, blessed and set apart for divine service. In the oratories of religious, seminaries, hospitals, &c.
· In his own house. · In the house, wherever it may be, in which he resides at the time. · In private oratories for just cause and for a time. · But a permanent privilege of celebrating in a private oratory can be granted by the Pope alone. Philip Neri, a native of Florence, was ordained priest in 1551. He obtained (1558) from the administration of the Church of St. Jerome leave to build over one of the aisles of that church a chapel, to which he gave the modest name of an "oratory," whence arose the name of the congregation. Known as the Oratory about this time many persons afterwards eminent in the Church and the world joined him, amongst whom were Cardinal Baronius, the ecclesiastical historian. In 1564 he was requested to undertake the charge of the Church of St. John the Baptist, Rome. From this date the commencement of the congregation is reckoned. The Oratory was introduced into England in 1847 by Dr. (afterwards Cardinal) Newman, who, during his long sojourn in Rome following upon his conversion, had studied closely the work of the holy founder and become deeply imbued with the spirit of his institute. Holy Order, according to Catholic doctrine, is a sacrament of the new law, by which spiritual power is given and grace conferred for the performance of sacred duties. By this name, in the language of the Church, is denoted the diocesan bishop, “who, in union with the common Father of Christendom, in virtue of the mission and the powers which he holds from our Lord, as a lawful successor of the Apostles, is called of common right, jure ordinario, to accomplish the Divine work of the sanctification of the faithful in the diocese over which he presides." The ordinary performs all ecclesiastical functions – teaching, administering the sacraments, governing the flock of Christ – in his own right; priests' perform them by virtue of the delegated right which they derive from their bishop. The chief rules of law concerning the collation of holy orders, in relation to Persons, Times, and Places, form the subject of the present article. Persons. – Women are incapable of being validly ordained, inasmuch as both the healthy natural instincts of mankind and positive Apostolic injunction (1Cor. xiv. 34; 1 Tim. ii. 11) require that women should be "silent in the churches." When mention is made in the "Corpus Juris,” of the ordination of deaconesses, this is to be understood not of ordination properly so called, but of a special benediction in virtue of which, in convents of women, those receiving it were empowered to read homilies or gospels before the community. To receive holy orders validly, it is necessary to have been baptized and, at least for adults, to be acting voluntarily. To receive them licitly, it is necessary to be in a state of grace, to have been confirmed, to take them in regular order, to have attained the canonical age required, to be under no censure, to be sufficiently educated, to be ordained either by one's own bishop, or, if otherwise, with his license and after the production of his dimissorial letters, and, lastly, to have a legitimate and sufficient title, by which is understood, either a benefice, or a patrimony adequate to a man's support, or religious poverty – that is the poverty which religious men embrace by vow. All orders in the regular course of things are conferred by bishops; but abbots also have the power of conferring minor orders on their own' subjects. Times. – The canonical age required for the tonsure and the three lowest grades of orders (ostiarius, lector, and exorcist) is seven years completed; for the acolyteship, twelve years completed. For the subdiaconate, the canonical age is 22, for the diaconate 23, and for the priesthood 25; in these three cases it is the beginning not the completed year that is meant. For the episcopate the full age of 30 years is required. The tonsure can be conferred on any day, at any hour, and in any place. Minor orders can be conferred at general ordinations, and also on any Sunday or holiday, and not necessarily during Mass. Sacred orders, according to the law, can only be conferred on the Saturdays in the four Ember weeks, on the fifth Saturday in Lent, or on Holy Saturday, and always during Mass. 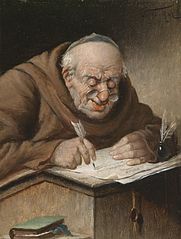 But since the plenitude of the Papal authority can dispense with any positive law, it is to be noted that orders are legally conferred on the members of all those religious orders which have received a special privilege of such a tenor from the Holy See at times other than those named by the law. The episcopate is conferred on a Sunday, or on the festival of an Apostle, unless a Papal indult has authorized the choice of some other day. Two grades of sacred orders that is the diaconate and the subdiaconate--cannot be conferred on the same day. The Council of Trent enjoined (sess. xxv. 8, De. Ref.) that sacred orders should be publicly conferred in the cathedral or in one of the principal churches of the diocese in the presence of the canons. Minor orders the bishop can confer in his own palace. But notwithstanding the injunction of the council, custom has long sanctioned the collation of sacred orders by the bishop in his own house or chapel, if any reasonable cause can be shown for the non-compliance with the law. Or Doorkeeper, holds the lowest of the minor orders in the Church. His office was more important in ancient times. He had to prevent the heathen from entering and disturbing the service, to keep the laity separate from the clergy, men from women, and to see generally that decorum was maintained. He had to guard the church and all that it contained, to open the church and sacristy at certain hours, to open the book for the preacher.